These were the very last pair and they just happened to be my size. This is what people talk about when they say things like "meant to be". Oh oh, and did i mention they were 7 pounds? But let's not kid ourselves, i haven't worn heels in...two years, maybe? I'd like to think that i can wear heels, providing they're not of the nonsense height, but London was pretty wet all the time. I wasn't ready to hurt myself, not with all the stairs i need to climb underground (seriously, London tube, you guys need more escalators). Typically, this only occurred to me after i bought these shoes. But who doesn't love to stare at pretty shoes right? Right? Righttt? In conclusion, no, i did not wear these to the musical. I was still in my Timberlands, which as always kept me warm and dry and hurt-free. 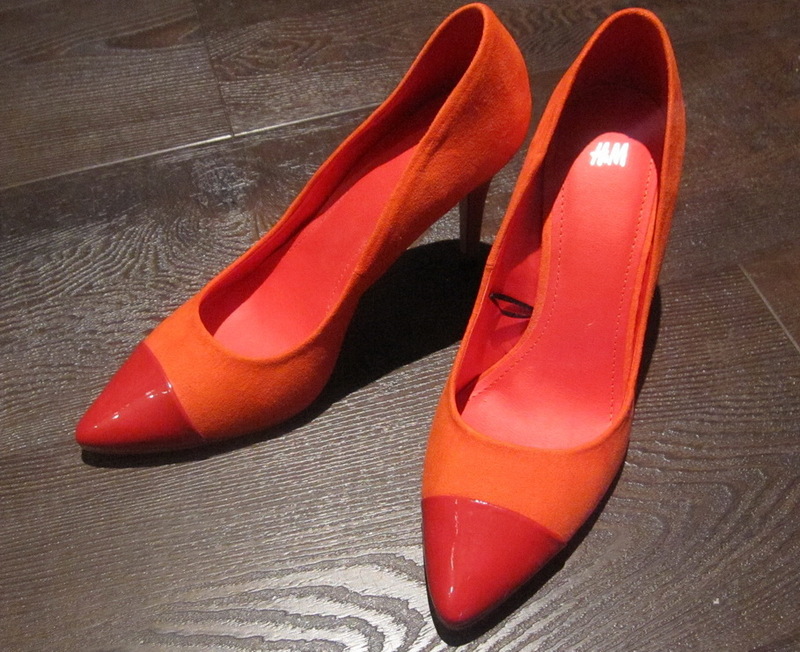 But these orange-red babies are staying with me. I did have time to hit Primark here, and got myself some nice, even handy things, really! I got a 5-pound blue jeans (which i did wear to the musical! ), a black open blazer (and yes, i got this owl print blazer in Manchester's Primark, totally forgot about that!) 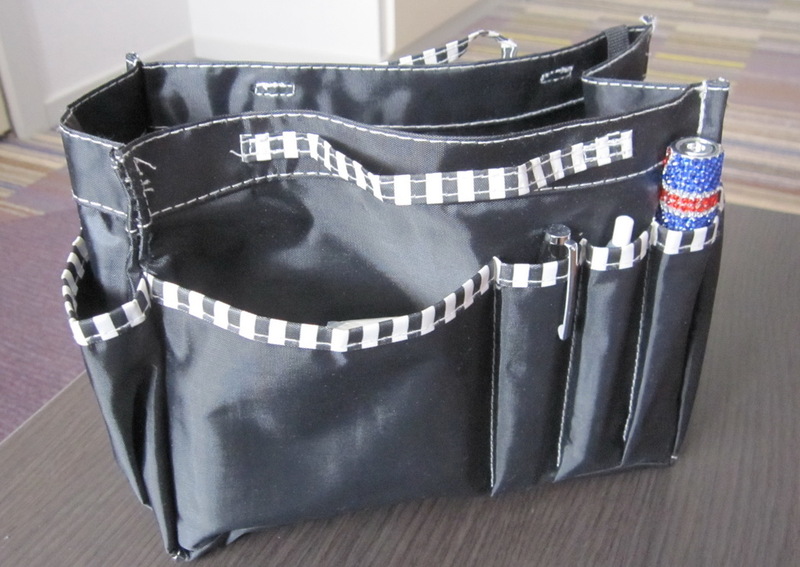 and this handbag organizer, which is just fantastic. It was mere days before my London-Primark trip that i was commenting to Shah it was hard to find things in my red Longchamp Le Pliage, since besides that little tiny compartment at the top, it has no other separate section. So i thought "Perfect!!!" when i saw this baby in Primark, and it was only 3 pounds. And yes, i carry three pens at all times, even i myself don't know why. It's not like they're in different colours. In fact i'm sure they're all black ballpens. But in my defence, i only got the third one on my visit to Madame Tussauds. How very touristy of me! Yes, it was the styling after a red lipstick that sucked me in. I just couldn't resist. When i was in Selfridges the first night, i made a point to visit Lulu Guinness. 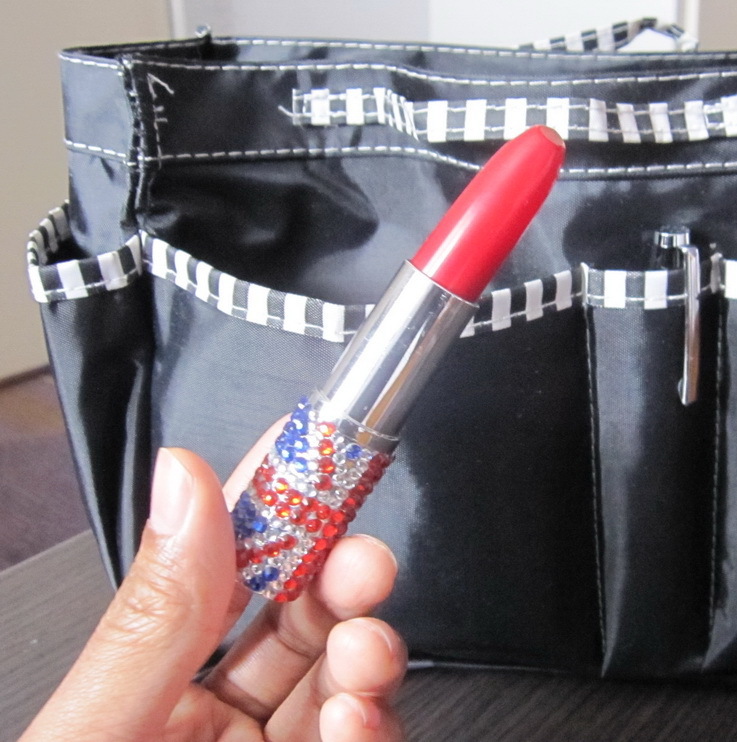 I was shocked to see the price on her lips clutch! I had this stupid idea that it was something that Shah could afford and it would be my "London's most prized posession", but at about 400 pounds apiece?? Goodness gracious! Me being the 1st class brat that i am, i was a little forlorn after that. But life is full of mystery and surprises, really. Two days after that, while Shah went for Friday prayer, i went on a little shopping excursion in Oxford Street by myself and had walked into Aldo just to compare prices with Paris and Malaysia (well, that was my intention initially...). Lo and behold, i found that Aldo was selling lips clutches too, at a tiny fraction of Lulu Guinness' price! I've always loved kitschy things like this, but Lisa Eldridge was really the one who pushed me into the red-lips direction. Or just lips in general, really. So i felt like it was just perfect that i found this in London, and obviously i thought "I MUST have this!!!". Instead of buying it straight away though, i decided to show Shah first, who was meeting me in Oxford Street after his prayer. His first words after seeing it? "Get it!". Honestly, i have the best husband in the world. Shah even went as far as checking the other Aldo branch that's quite a bit of walk away, since the Aldo we were only had one red lips clutch remaining, the one on display. It was slightly battered, to Shah's dissatisfaction. I sat in the store, guarding the clutch in case the other branch really doesn't have it since the lady who attended to us checked in their system and said the clutch isn't showing up in the other branch's system. When Shah came back, he was armed with the info that another Aldo a few stations away supposedly still have three of it still, so we raced there immediately, only to find out that the info was incorrect and that third branch only had one left and it was on display as well. But fortunately it was in a much better state, so, here it is with me now! 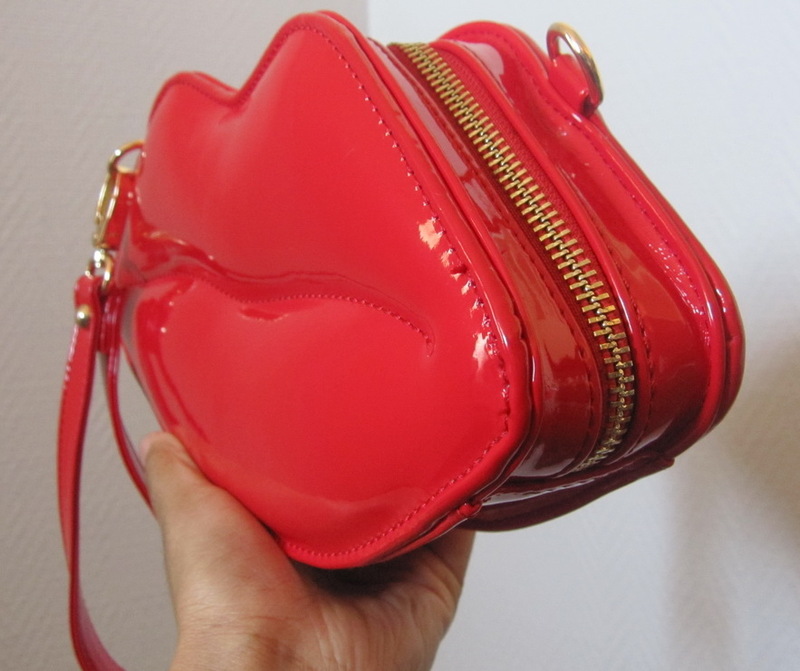 It's no Lulu Guinness, but it's safe to say i'm in love with it. Shah isn't Aldo's biggest fan, as he believed Aldo ripped off other designs a lot; i've heard this conception a few more times online as well. I can't contest that, since this is obviously a perfect example of it but i like that Aldo helps us less $-blessed people to try and own bits of the extravagant things some of us can't afford. 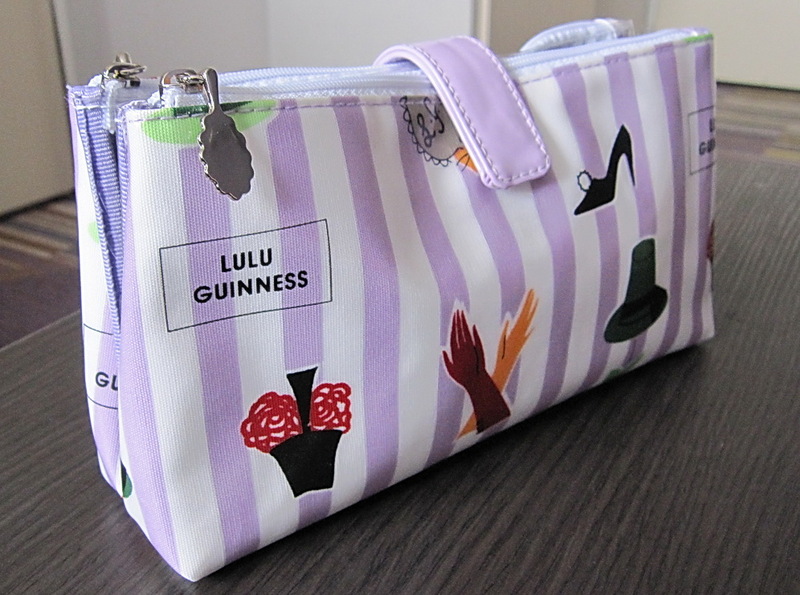 Right, speaking of Lulu Guinness, you didn't think i would leave London without owning something from it, right? This is why i loveloveLOVE outlet malls. I have a cousin who lived in England to do her master's, who had kindly gave Shah and i a few tips of where to go and what to do in Manchester and London. 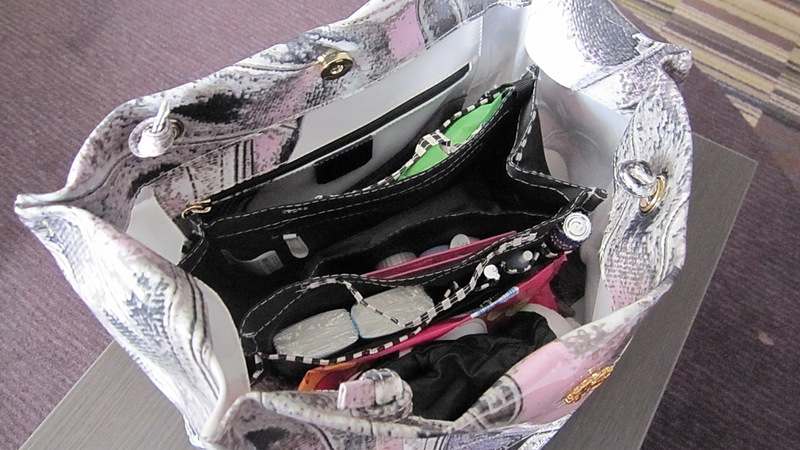 The number one thing on her list was "MUST visit Bicester Village!". 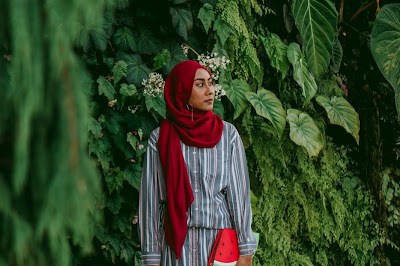 When she, her husband and son came to visit Paris (sadly i was not here yet, but lucky Shah got to hang out with them), they went to La Vallee Village and was not all that impressed by it, telling Shah Bicester is bigger with more brands. So if she said it's a must, well a must it is then! Bicester Village is definitely a little bigger (but i still love you, La Vallee!). Apparently these two "villages" are owned by the same boss, and i can believe that as they're styled in the same way. Each of them offers some brands that the other doesn't, like Bicester has Lulu Guinness (nowhere to be found here in Paris so far) and Kate Spade. 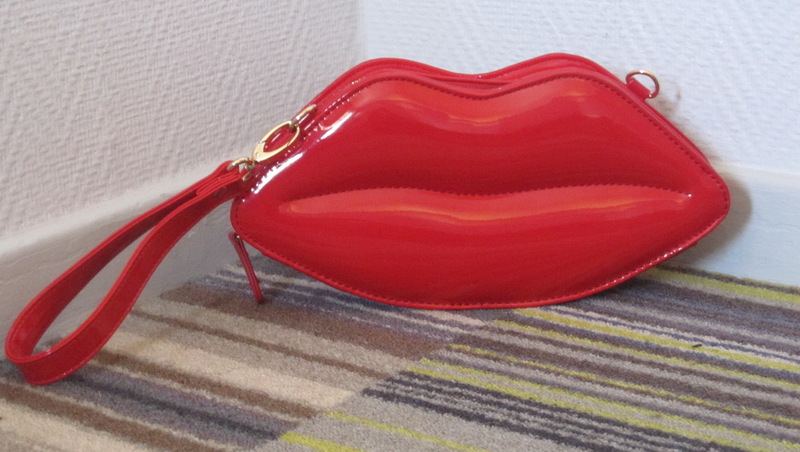 Some versions of the lips clutch were available at half price in Lulu Guinness, but still way out of my price range. 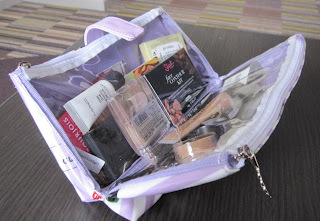 I was coincidentally looking for a good small case to store some of my makeup things, something i couldn't find in Primark and Marks &Spencer, none to my liking anyway. When i saw this though, i knew i wanted it straight away. 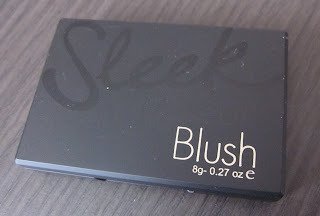 My blushers, bronzers, concealers and eye pencils have found their home! 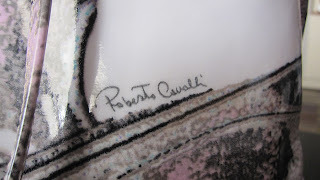 Shah pointed out an adorable red handbag in Kate Spade, but i saw this shopping bag in Roberto Cavalli, with printing that i loved at first sight. I must have been crazy to do this, but i decided to get the shopping bag, which was a third of the price of the red Kate Spade. I wonder if i'll regret this decision later on. 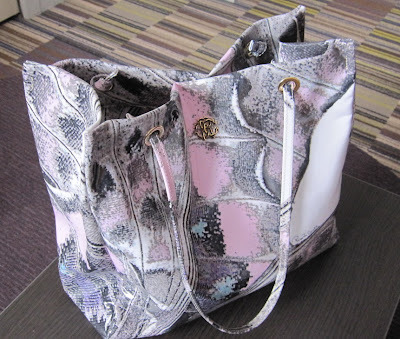 But right now, i'm definitely not using this Roberto Cavalli shopping bag as a shopping bag, because as someone who has never owned Roberto Cavalli anything, this bag is good enough (and definitely pretty enough) to be used as a handbag. I mean, come on, is that print not "so-me"? 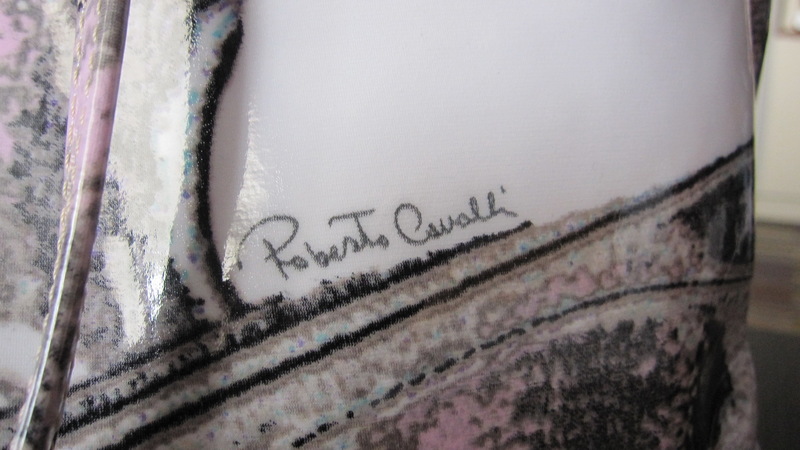 The European lady at the counter was a bit stand off-ish initially, but then she went inside their storage place and got me a new one with "Roberto Cavalli" printing, front and back. So now i think she really is kind of sweet. Maybe some Europeans are just like that. You know, like the French. Icy on the exterior but mushy on the inside. Possibly. OK, not 'mushy', maybe just a teensy bit warmer. But i guess if i were a person with a job, i'd get both. To me though, the upside of not having a job is every little thing your husband buys for you feels like a present, and it's always the best feeling ever. Everyone seems to think Shah spoils me too much, but i'm glad he doesn't think so though. Ho. Ho. Ho. 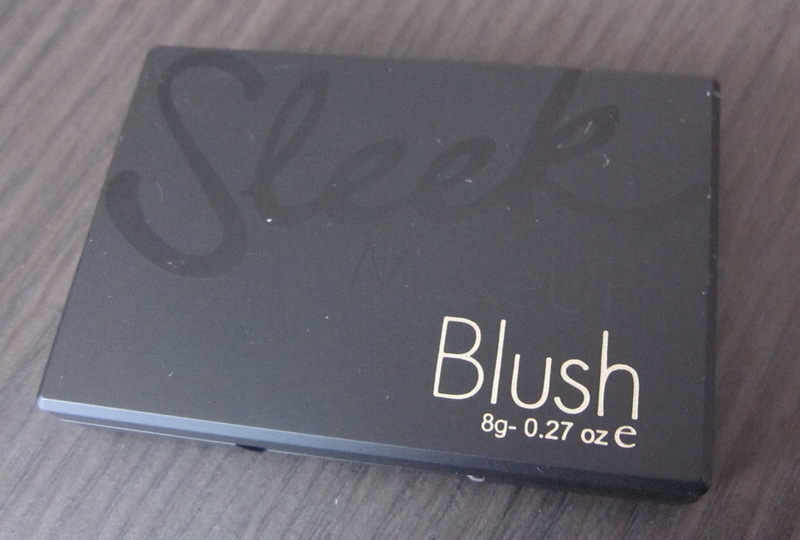 The last thing i should mention is my Sleek blush. I had forgotten to add this in my first draft, but i simply must add it! The colour is just amazing. I've used it only once, and i can't wait to wear it again. 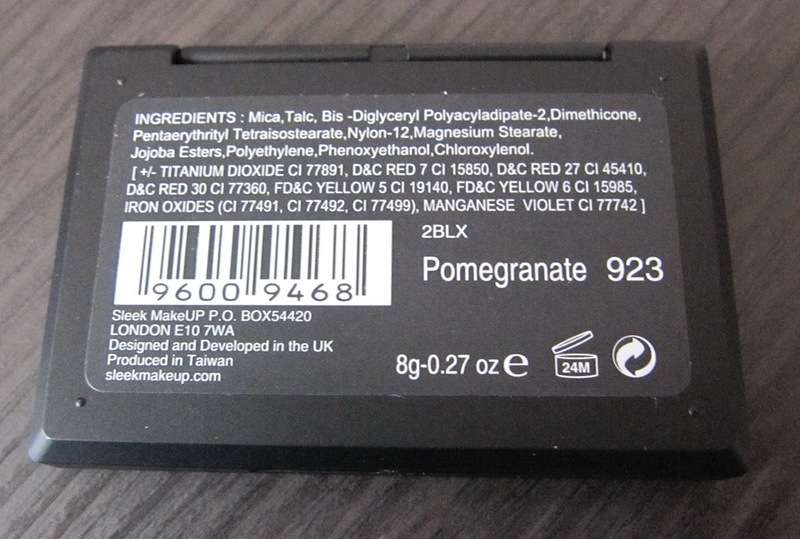 This was the very last thing i got in London, the day i left for Paris. 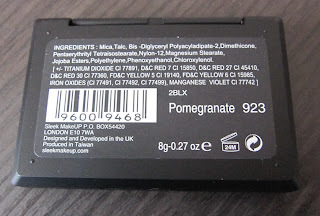 I went around for quite a bit to get this by the way, since the first two Superdrug i went to ran out of this! I had a great, amazing time in London. Looking forward to going there again!